Rev. 4/18 N Picnic Pavilion Tamworth Pavilion Webster Education Building and Classrooms TRAILHEAD GALLERY Owl’s Roost Cafe BARRED OWL WHITE-FOOTED MOUSE Welcome Center Admissions, Howling Coyote Gift Shop, Administrative Offices WOOD ENERGY ECOTONE MAMMAL RED FOX GRAY FOX FISHER COYOTE BOBCAT MOUNTAIN LION WHITE-TAILED DEER RIVER OTTER Red Barn GORDON CHILDREN&apos;S CENTER AND INTERACTIVE PLAYSCAPE BLACK BEAR RAPTORS RED-TAILED HAWK GREAT-HORNED OWLBROAD-WINGED HAWK BALD EAGLE RED-SHOULDERED HAWK TURKEY VULTURE NORTHERN GOSHAWK CELEBRATE BIRDS Black-crowned Night-HERON Cattle Egret NH GEOLOGY LOWER POND WATER MATTERS MINK TURTLE FISH AMPHIBIANS LIFE UNDERGROUND MARSH BOARDWALK UPPER POND ECOTONE TRAIL FOREST TRAIL MT. FAYALTrail MT. FAYALTRAIL AMPHITHEATER LAKE CRUISE HEADQUARTERS KIRKWOOD GARDENS SOLAR Bat House Walkway to Lake Cruises Lot 3 Lot 2 Lot 1 US ROUTE 3 To Meredith NH ROUTE 113 To Ashland Entrance EXIT Map Legend Live Animal Trail 3/4 mile Walking/Hiking Trail Information Picnic Area Food (July-August) Drinking Fountain Restrooms Accessible Gift Shop Parking Eme rgency Callbox This is a smoke-free property. EXHIBIT Gates close at 5:30 p.mSecurity Cameras in use Wild animals are wild! Please do not feed or touch wild animals you may encounter. Plan at least two hours to walk the 3/4 mile live animal exhibit trail which meanders through open meadows, mature forests, and marsh boardwalks on a packed gravel path.Click on an exhibit to learn more. The Welcome Center is where you begin to explore the Science Center. Purchase trail admission and Lake Cruise tickets at the Admissions windows and explore the Howling Coyote Gift Shop. The Welcome Center also houses administrative offices. A model of sustainability: saving energy and dollars. The Wood Energy Exhibit uses sustainably-harvested, locally-sourced wood to heats five major buildings on the Science Center's campus. For the sake of our animals please keep food and drink (except for water) off the animal trail. 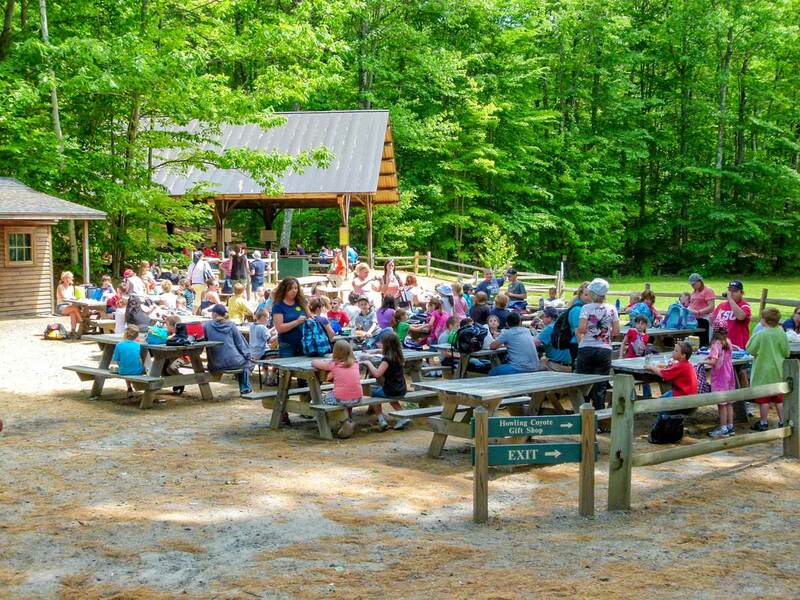 Enjoy a lunch at our picnic area conveniently located at the start of the live animal exhibit trail. Bring a lunch or purchase lunch from the Owl's Roost Market (open July and August). The covered Picnic Pavilion will keep you dry on a rainy day. 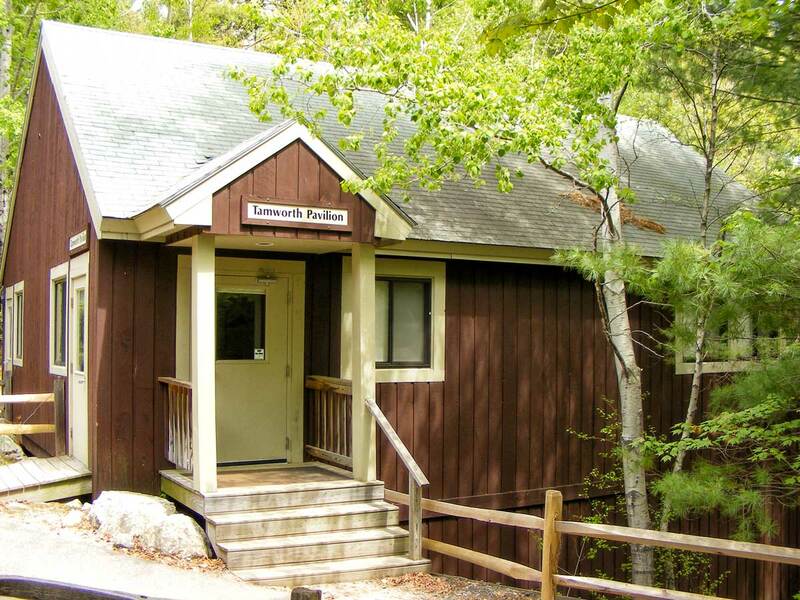 The Tamworth Pavilion is used for school programs, outreaches, group programs, and events. It is also available for private functions. The Webster Education building features three classrooms primarily used for school programs. It also houses administrative and education offices and animal care. 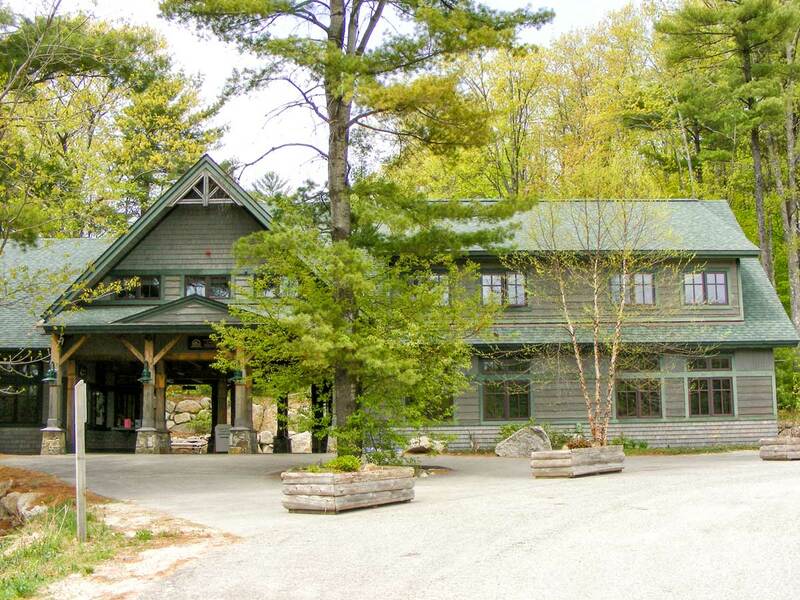 The Trailhead Gallery is currently closed for the expansion of Blue Heron School. It will reopen in late June with Barred Owls, White-footed Mice, and our introductory Exhibit. It also is the home of the Owl's Roost Market from late June through Labor Day. An amazing number of animals make their living in the soil. One handful of healthy topsoil may contain more living organisms than there are humans on Earth! You will meet ants and earthworms up close and peer at tiny soil animals through a microscope. You can also travel down a human-size chipmunk burrow. This exhibit addresses concepts such as how soil is formed, which organisms can help create and aerate soil, and what adaptations animals may have in order to survive underground. The Amphitheater is comfortably located in the shade of the trees on the animal trail. Our daily Up Close to Animals presentations (July and August) are held here, wether depending. If it is raining presentations are held in the Webster Education Building. Naturalist led presentations feature a variety of animals including birds, mammals, and reptiles. Explore the world of water 18 water-related exhibits. Listen to frog calls; take a virtual tour of the Squam Watershed; create an interactive landscape in kinetic sand to learn how water moves; learn about ice; visit the live mink, turtles, and frogs; spy fish in the warm and cold water aquariums; plus much more! Coyotes are cousins to dogs, wolves, and foxes first seen in New Hampshire in 1944. They have spread across the state from the northernmost reaches down to the seacoast. Coyotes are currently common throughout the state. This exhibit houses the Science Center's resident male coyote. Try to match the coyote posture to the behavior and listen to a coyote call. Plus, learn how coyotes and wolves are similar and different. The Ecotone Mammal Exhibit reveals the interrelationships of creatures living in an "ecotone" or the edge between two natural communities. There is often greater diversity in wildlife at these edges. Using interactive displays, this exhibit describes these areas, provides examples of animals that depend on them, and also addresses some of their adptations. This exhibit is the home to three different types of animals that are generally found living in an ecotone: red fox, fisher, and gray fox. The bobcat gets its name from its short, or "bobbed" tail. An adult weighs 15 to 25 pounds and can live up to 14 years. Predators like bobcats help maintain healthy populations of prey animals by weeding out sick and injured animals. This in turn reduces the chance the prey animals will overeat and damage their habitat or starve. See live bobcats up close as you learn if bobcats have any predators and what they eat. The mountain lion has one of the widest distributions of any mammal in the western hemisphere. They are able to survive a wide range of conditions and have the skills to hunt many different types of prey. This exhibit emphasizes the adaptations these animals have to hunt - how high and far they can jump or how much they can lift - and also addresses the ecological concept of extirpation. Large carnivores are rarely seen in New England since they need a lot of uninhabited space. An example of the interrelationships between animals and humans would be when early settlers, afraid for their safety and that of their livestock, over-hunted and eliminated mountain lions in New England. See if you can see the retractable claws of the live mountain lions at this exhibit. Mountain Lion Training takes place every Thursday at 12:00 p.m. at the Mountain Lion Exhibit during July and August. White-tailed deer are found throughout New Hampshire. This exhibit addresses many of the adaptations that enable deer to outwit their predators and survive, and also emphasizes some of the natural conditions that limit the population of deer in New Hampshire. Most natural predators (wolves and mountain lions) were extirpated in New Hampshire by the turn of the nineteenth. The only remaining predators of white-tailed deer in New Hampshire are humans and also occasionally domestic dogs, coyotes, and bobcats. Observe the live white-tailed deer in this exhibit and learn about their habitat through hands-on activities. The Red Barn has two accessible bathrooms and classroom space. It is also used for Science Center storage. Colorful plants in full bloom bring this informal garden to life, naturally attracting bees, butterflies, and birds of many species. Kirkwood Gardens is free and open to the public. Park in downtown Holderness or behind Kirkwood Gardens. River otters have adaptations that allow them to live in marshes, swamps, rivers, ponds, and lakes. Otters are commonly found in New Hampshire. Their habitat requirements include unpolluted aquatic environments with unmanaged tree-lined shores. This exhibit emphasizes these requirements and also provides examples of aquatic adaptations and threats to otter populations. Watch live river otters swim with underwater viewing at this exhibit. Join us for River Otter Feeding every Monday, Wednesday, and Friday at 11:30 a.m. from May 1-November 1. Go on an adventure as you play the role of a red squirrel. Climb rocks and logs, scramble through tunnels, and balance on branches to escape predators. Adults must supervise children while they are on the Playscape. Children under 5 must be accompanied by an adult at all times. Children must have appropriate footwear. No flip-flops. This two-story barn inspires students to learn more about natural concepts including adaptations, habitats, and interrelationships. Students learn as they use their eyes, ears, noses, hands, and brains while they climb through a giant spider web, invent an insect, crawl through an underground tunnel, listen to nocturnal animal sounds, and explore this activity-filled space. Black bears live in heavily wooded areas in New Hampshire. Although classified as carnivores, the majority of their diet consists of plant materials. Black bears have many interrelationships in the forest. This exhibit provides examples of some of these interrelationships and also provides details about their diet, behavior, and populations. You can learn about bears by crawing into a winter den, completing puzzles, learning about bees with our viewable hive, and observing live black bears in their habitat. This exhibit celebrates the life of birds by providing examples of unique adaptations birds have for flight and examining some concerns about bird populations. Through the use of bird mounts, you will see birds in various habitats. You will also observe live wild birds making their way to and from feeding stations. Learn about adaptations birds have for living in different habitats through interactive activities. Find out about one of Squam Lake's treasures, the common loon, and the factors that threaten it, including loss of habitat due to increased human activity along the lake shore, the decrease in privacy on open waters, and predation by increased gull and raccoon populations. Raptors are a group of birds that catch, kill, and eat other animals (prey) using sharp talons and a sharp hooked beak. This exhibit highlights adaptations unique to raptors and demonstrates interrelationships between raptors and other living things. The Raptor Exhibit is comprised of four pavilions exhibiting the diversity of raptors, a group of birds that includes hawks, owls, eagles, and falcons. Live examples of some species found in New Hampshire include the red-tailed hawk, great horned owl, broad-winged hawk, bald eagle, red-shouldered hawk, goshawk, and turkey vulture. The Upper Pond provides examples of different types of wildlife that depend on wetlands and ponds. Some animals spend their entire life in water, like fish, while others rely on water for part of their life cycles, like toads. If you listen closely you can usually hear the croak of a frog or may even observe a great blue heron, duck, or other water-loving bird at the Upper Pond. The Wetlands Walk takes you across a small man-made wetland, over an area of wet meadow, and across a small stream. Watch for frogs, salamanders, and turtles, as you learn the importance of wetlands along the way. This exhibit highlights the geologic history of our planet and provides examples of the different types of rocks found in New Hampshire. Explore different rock types and take a walk through time to learn about the formation of our Earth. 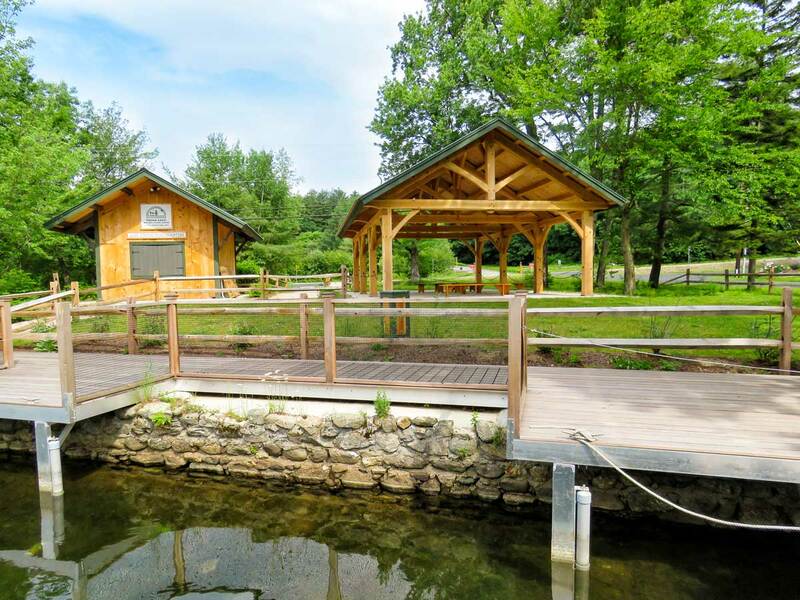 Solar powered Lake Cruise Headquarters provides a comfortable departure point for Squam Lake Cruises. The timberframe pavilion with benches provides an outdoor classroom for school programs and a place to gather before public cruises. Learn about solar electricity and lake turnover at interactive exhibits. He treasured this corner of the earth and wondered of its mysteries.The Gephart Trail is informally and frequently called the live animal exhibit trail or live animal trail on this website and in other published pieces. The Gephart Trail is named in memory of William Stephen Gephart (1951-1968). His parents, F. Thomas Gephart and Sarah Lou Taylor Gephart, shared that love of earth's mysteries and helped others to know it through their support of the Science Center. 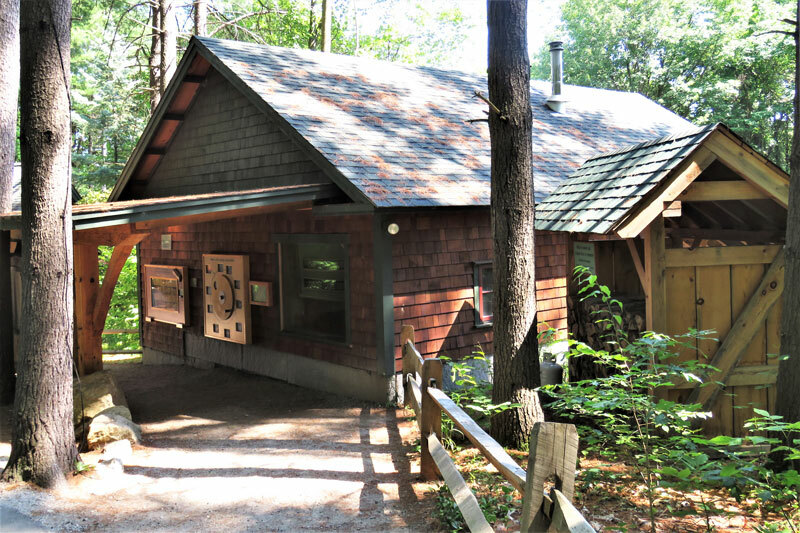 Squam Lakes Natural Science Center has educated and enlightened visitors since 1966 about the importance of our natural world thanks to the vision, energy, and generosity of people such as the Gephart family. Tom and Sally were involved in the early days and both served terms on the Board of Trustees, as later did their son John.